Please vote for your favorite collection here: https://www.surveymonkey.com/s/YY2X2QW. Voting ends at midnight on November 30th EST, and the winner will be posted on 12/01/13. We have a lot of great entries for this Fall themed challenge. Please vote for your favorite collection here: https://www.surveymonkey.com/s/CHFYXYF. Voting ends at midnight on October 31st EST, and the winner will be posted on 11/01/13. Fabulous entries! The NEW topic was wide open. Please vote for your favorite collection here: http://www.surveymonkey.com/s/VGKBLZ3. Voting ends at midnight on October 1st EST, and the winner will be posted on 10/02/13. We need your vote! The NEW topic was: SUMMER! Jewelry by Steve Riley: www.etsy.com/shop/JewelrybySteveRiley. Please vote for your favorite collection here: http://www.surveymonkey.com/s/7RRB3S7. Voting ends at midnight on August 31st EST, and the winner will be posted on 9/01/13. Wedding Inspiration – Add a Pop of Color! 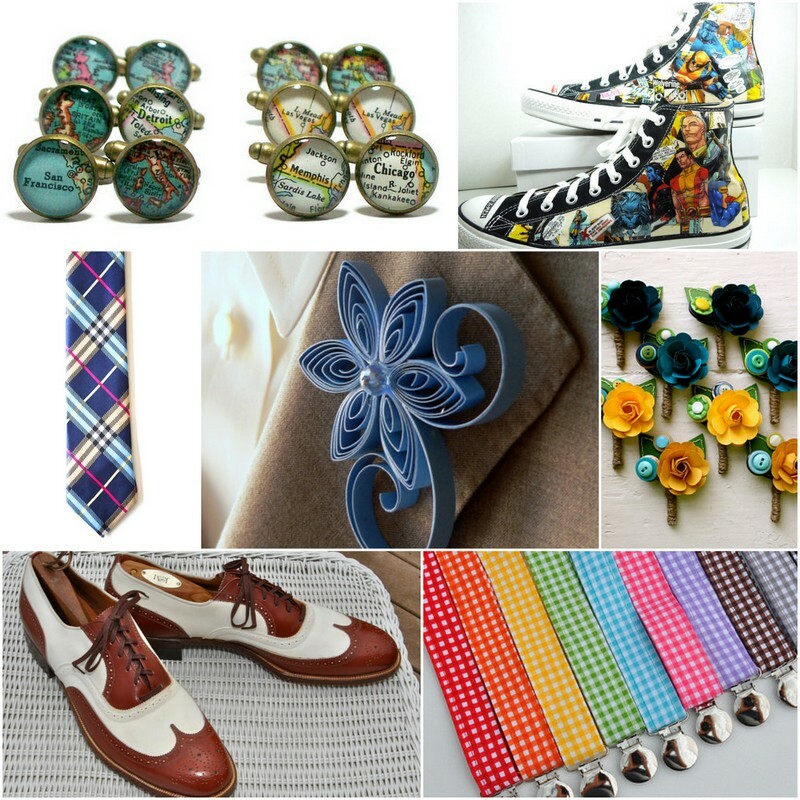 Brides and grooms can really have some fun by adding a pop of color to their wedding outfits. 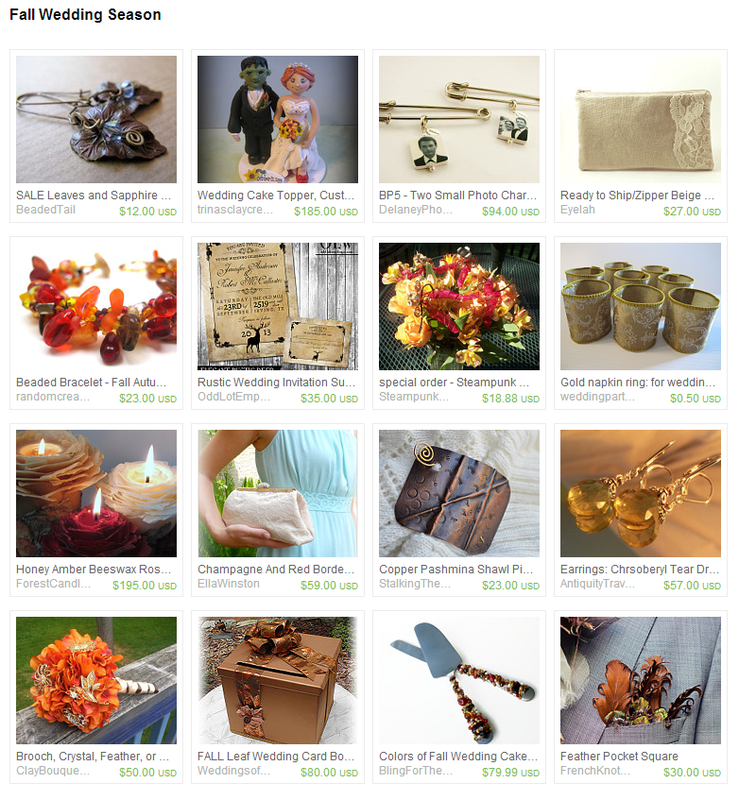 To give you ideas, here are some colorful handmade and vintage items from Etsy shops. Fyi, many Etsy shops can customize items to your desired colors and styles. So don’t hesitate to contact a shop whose work you like! Handmade flowers shoe clips by ChloeANDMaddie. Karen from Bling For The Table: www.etsy.com/shop/BlingForTheTable. Voting ends at midnight on June 30th EST, and the winner will be posted on 7/01/13. Julie Farrell from Odd Lot Emporium. Voting ends at midnight on April 30th EST, and the winner will be posted on 5/01/13. Spring Weddings means lots of pretty Pastel colors and this Spring Fashion Season has Florals popping up all over the Runways. A gorgeous bridal trend with large splashy florals and soft pastels makes for such a beautiful wedding theme. I thought going through some of the popular colors for this season would make a nice blog post. All the colors are so yummy, I want to eat ice cream now! Lovely Lilac is a flattering color on nearly everyone and makes it a great choice for brides and bridesmaids. This gorgeous lavender bridal headband from ClayBouquetShop on Etsy is perfect for adding something to the brides to tie in the color scheme with her bridal party. A day or evening wedding is a great time to use a beautiful shade of purple, lavender or lilac for the bridesmaid gowns. This stunning lilac cocktail dress was over $3000 in Europe but take a few photos to a local dressmaker and you can have something similar created for much less. The value of having your dresses custom made by a seamstress cannot be underestimated. If you price it, you will find you can have exactly the color, fabrics and a unique one of a kind style at your wedding for an affordable price compared to the high prices of OTR ( off the rack) dresses that still need alterations. The sweet little flower girls will look adorable in some pretty dresses with lots of tulle and satin. Wedeclectic team member, carolinesboutique has the perfect tutu for your little one. Another fun site for flower girl dresses is Littlemissprincess.com. 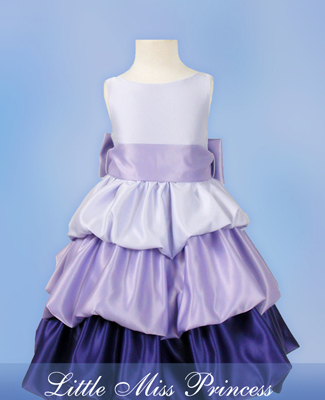 I just love this layered flower girl dress with different shades of purple, lavender and lilac. A toast to the bride and groom can be even more meaningful with some lovely had created and etched Champagne Flutes. I just discovered this Etsy seller recently and love his gorgeous work. Jeff is an independent artist and creates laser cut glassware for his shop. He is really remarkable. Wedding boxes are a fun item to add to your wedding in your theme color and this one from SweetJonesin is so pretty. A wedding box can be used at the Bridal shower, Reception and more so it is worth getting to add some fun and use for storage after the event. Small decorated boxes in your theme color can be made for Bridesmaid gifts, party favors and guest thank you’s with some ribbon and dried or silk flowers very easily. Even the groomsmen can join in on the fun. 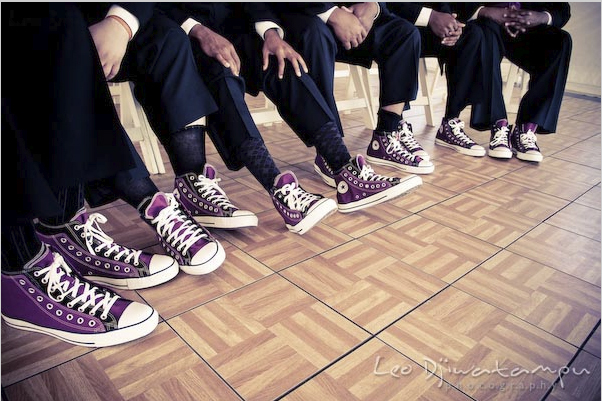 My friend is getting married in June and her groom has agreed that all the men in the Bridal party will wear purple converse sneakers! I thought Josh was being very supportive and fun when he told Monica that he would do this for her. There are many more fun ideas on http://trendygroom.com/ for the man who has a sense of humor. What color will be next? Leave a comment with a suggestion. Maybe peach or mint green or do you fancy pink? It’s time to get your vote on! This month there are only 4 entries, but I don’t know if that will make voting any easier; they are beautiful! Check out these gorgeous collections; each one featuring both of January’s challenge winners: Clay Bouquet Shop and Bag Secrets. Voting ends at midnight on February 28th EST, and the winner will be posted on 3-01-2013. Thank you so much for voting! 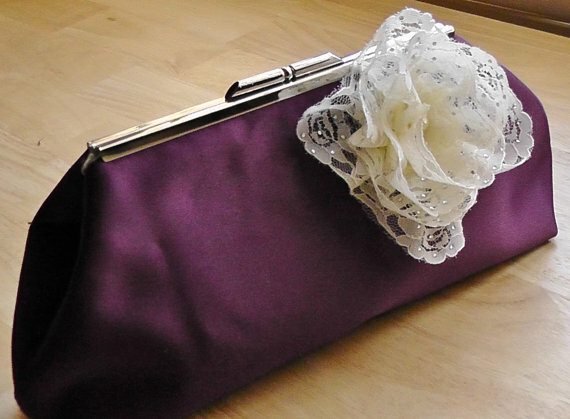 Kristin creates custom clutches and bags which are perfect for weddings, proms and special occasions! 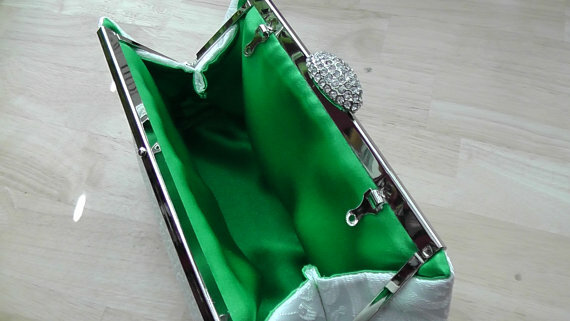 She will gladly add a personalized tag with your name and wedding date inside! She can make custom bags for your bridal party, a perfect bridesmaid’s gift that they can use for years! 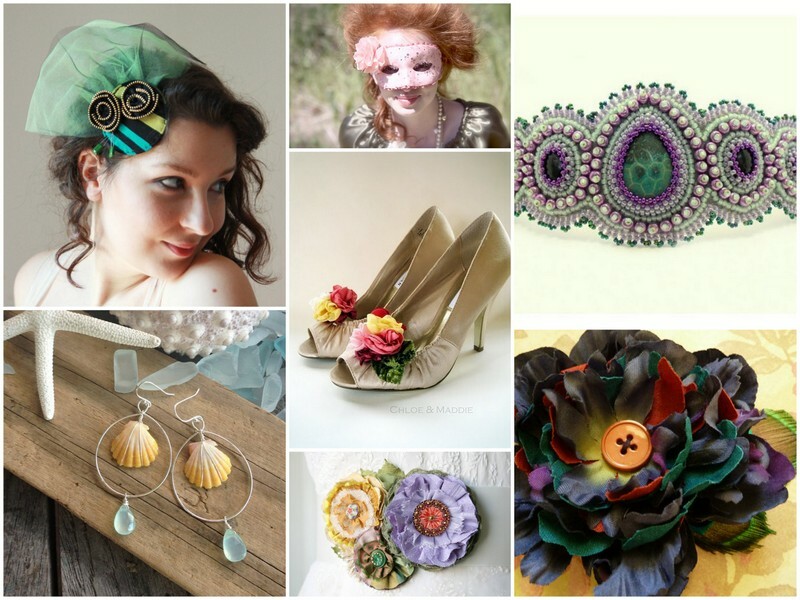 And she can match your wedding colors…just look at the wide array of what she offers! Kristin is offering a 25% discount to their shop to one lucky winner anywhere in the world! 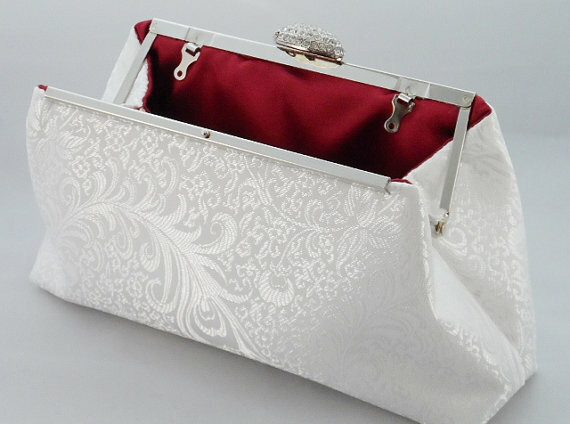 It can be used on one item or enough clutches to accessorize your entire wedding party! This giveaway will run until midnight, February 28th, but don’t wait! Commenting, including your favorite item from BagSecrets‘s shop. Commenting that you hearted BagSecrets‘s Etsy shop (and your Etsy name for verification). Commenting that you friended BagSecrets on Facebook (and your FB page for verification). Commenting that you followed BagSecrets on Twitter (and your Twitter page for verification). Commenting that you followed BagSecrets on Pinterest (and your Pinterest link for verification). The winner will be chosen randomly, verified, and contacted on March 1st via email (please provide it!) with the good news! *The discount does not apply to shipping fees. It can’t be combined with other discounts or promotions.